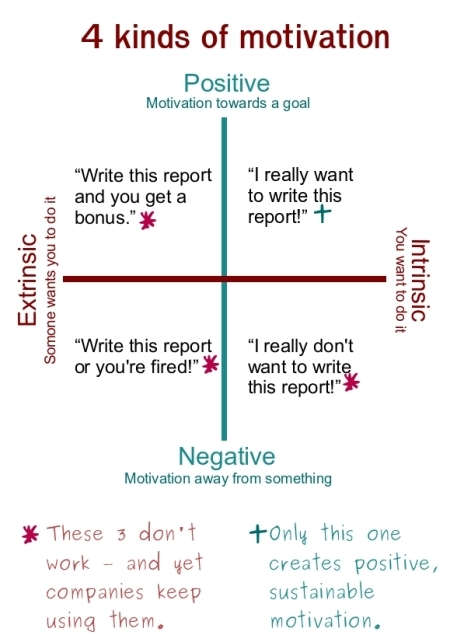 Intrinsic and extrinsic motivation, aka basic behavioral psychology. Image via p2pfoundation.net. Maybe I’ve been reading too much Aristotle, but I do not believe that doing nice things always makes you a nice person. At the core of this argument lies a key question: what constitutes a “nice” action? If taken without an inner moral, someone who does nice things is not a nice person, he or she just obeys society’s standards. I’m sure supporting racially segregated water fountains was considered nice quite a few years ago – back then, wasn’t that just a measure to protect the immune systems of a superior color? Preventing gay people from garnering equal rights, fighting against a woman’s choice to attain an abortion, and other divisive issues highlight the difficult, if not impossible task of creating a single principle of niceness. Moving away from hot button topics, if an individual shows external motivation, he or she does not possess the same selflessness displayed by someone with intrinsic kindness. If a man named “Bob” acts nice to you for the sake of appearing nice, to some extent you may not notice anything amiss. But if that extrinsic impetus were to disappear – if no one were there to judge Bob other than Bob himself – would Bob still fight for you or treat you with genuine compassion? While these terms branch out into the abstract, a nice person should have some inner goodness, some actual extent of caring, or some deeper value that motivates him or her to serve a cause for the sake of the cause itself. Being a good person is not black and white; it is multifaceted, comprised of several qualities, some perhaps inborn, others requiring hard work. We can’t just assume Britney Spears is a good person because she says she loves gay people and dedicates one of her songs to us – if we think with depth, her statement harms gays because it generalizes us as “adorable” and “hilarious” when in real life I know some gay people who are neither of those things like me wait what. I agree that action helps shape character, but it does not determine it: if someone with anti-Semitic beliefs like Hitler were to embark on a recycling rampage, he would not impress me. The same thought process applies to a misogynistic man who appears considerate and kind. Even if he does not degrade women himself, that aspect of his overall entity would affect whether or not I would perceive him as truly nice. Just like correlation does not imply causation, good deeds do tend to form good character, but not always. While I appreciate and love acts of kindness, we should examine why we do the things we do, so we can improve ourselves inside and out. One reason why I haven’t been able to blog lately: writing strange haikus for scary college games. Do you guys agree or disagree with what I’ve written? I apologize for the repetition of “nice” and my lack of specificity concerning “niceness” and “goodness.” I will ruminate on that later on. Do you believe in intrinsic and extrinsic motivation, or that one is better than the other? Every time I write a post it makes me miss blogging more and more; I cannot wait to respond to several of your lovely comments and messages after lunch. Schoolwork, social life, and Assassins have kept me busy – but once Thanksgiving and winter break roll around, you will see more activity from this quiet voice. You can check out my brief thoughts on The Masque of the Red Death by Edgar Allen Poe and King Lear by Shakespeare here and here respectively, and I hope you all have a wonderful week! I was actually wondering about this a couple of months ago. Sometimes people can be extremely nice and yet you won’t like them because you can tell that they aren’t being ‘genuinely’ nice. It happens to me a lot. I want to like someone because they are really nice but there seems to be this ‘fakeness’ to their niceness, like they aren’t being nice because they actually mean it but because they are expected to be nice. Being a good person is definitely not just black or white, there are many shades of grey in between. If you’re doing something ‘good’ do it because you want to, not because you HAVE to. Be nice because that is who you are, not because being nice is ‘socially accepted’. Yes, exactly. An individual’s intentions should be taken into account, because some mean it more than others. Thank you for agreeing and commenting – not like I would value your commentary any less if you disagreed, but you know what I mean. See, I really like the perspective you took on this topic. This actually reminded me of a phone conversation I was having with my mother yesterday, and we were talking about people we know who are “nice” and we were sort of arguing about who was nice and who was not nice. My mother has a tendency to try and paint me as someone who’s not “nice” and compares me to the people we were talking about, but that’s a bit off topic. Anyway, I’ve been trying to figure out a way to articulate my thoughts on this issue, but you managed to do it perfectly. There are plenty of people who, say, do volunteer work or give money to charity, like celebrities, but that doesn’t necessarily make them nice people. Also, back to the phone conversation I was having with my mother yesterday, my mother has a tendency to ignore people’s homophobia, racism, and sexism, so to her, as long as they are nice to her and obey their parents, they are considered nice people in her books. It’s really interesting, because one of the people who she was telling me was “really nice” (a girl who goes to my school) is actually really racist when no one is looking (she’s made comments about her Asian floor mates and how they were “abnormal” for studying “all the time”), so something like that just makes me put-off to people who seem like they’re really nice to my face because I, as someone of privilege, have people being nice to me all the time, so it doesn’t take long for people to show their true colors to me. I’m glad that you agree with my perspective to an extent and that we think about this issue in a similar way! Just like how good people can do bad things sometimes, bad people can do good things. Like with your anecdote about the girl at your school, we have to examine deeper beneath the surface to evaluate whether people are truly good/kind or not. Thank you for reading and for your thoughtful comment! quite similar. Though I am insane. I guess I’m insane as well, then. (: Though great minds think alike, so that may come into play. but small mind seldom differ. Niceness, on the other hand, seems to imply this general veneer that society requires for you to be integrated into it, without any hiccups or glitches occurring. Am I making sense? I think this is then niceness you were talking about when you mentioned Bob. Bob could be the guy who comes to work and greets everyone politely and asks how you are and has the appropriate responses but does because that’s what’s required to function in the work place, those little verbal transactions which are (ultimately) meaningless, cos how many people actually remember them, or even want an honest answer if they ask how you are? (I might be sounding bitter here, but I am being objective.) It’s just one of those things you can’t help noticing. And maybe Bob is a ‘good’ person with ‘good’ character and strong morals, but we’d just never know because we’re all required to have the same surface character, more or less. The societal etiquette. And I have to say, I strongly disagree with your friend’s outlook, that if you do nice things you are a nice person. Again, it comes with defining nice, and it’s all relative as well, because we all come from different cultural and socioeconomic backgrounds. For example, if Person A’s had a relatively comfortable lifestyle for most their lives, and ‘life has been kind’ to them they will most likely be a nice person (more or less). On the other hand, if Person B hasn’t had the same advantages, then their actions might not be accepted by society. To society, Person A would be the nice one. And yet we would have no idea how Person A might have thrived in that setting. And then there’s the other side of the coin, where Person B, despite the hardships, might still grow into what society deems a good citizen. And the opposite could happen for Person A despite their comforts. So…it’s not just not black and white, it’s more like a psychedelic maze to me. And as your friend says, it’s not like we go around ACTIVELY distrusting people – that would be exhausting – it’s more the fact that we don’t actively trust them (if that makes sense?). Cos then, by her argument, everyone who is ‘nice’ could then be one you could potentially trust, and then confide in. And yet we don’t do that? Why? Not because we think they are going to blab your secrets, but because it’s really none of their business, despite their ‘niceness’. And OF COURSE intentions matter (I would no trust your friend and her cow either). There’s a difference in a “How are you?” that’s asked because the grocer at the grocery is compelled to say it, or the workmate is compelled to say it to appear polite, to the one said by someone who genuinely wants to know and maybe sees something to be concerned about in your appearance/behavior. SIGH. This was exhausting to write first thing in the morning. *sob* I’m so sorry it’s long. It sounds like you’re happy at college, Thomas. And those late night discussions are the best even if you do find out that you can no longer trust a friend and their cattle. Please don’t apologize for the length of your comment, I need to apologize for taking so long to always respond to them! I agree with pretty much all of you’ve said, though I need time to think about your socioeconomic example (or the comparison of Person A and Person B in regard to their privileged or non-privileged upbringings). But, a resounding yes to the idea that there’s a difference between people who ask “how are you?” because they genuinely care and people who ask “how are you?” because they feel obligated to either consciously or unconsciously. Thank you for the thoughtful comment as always! We definitely don’t go around actively distrusting people, but there’s a reason why we’re not best friends with every single person we know. As a psych honours student, I’m kind of required to know that there is intrinsic and extrinsic motivation. Coming from a behaviourists perspective, it’s important to have both types of motivation. In terms of a job, if you’re only intrinsically motivated, you would ask not to be paid to do a job that you love. However, if you’re only extrinsically motivated, you’ll end up in a job you hate and are only in to pay the bills. So it is important to have both. I don’t believe there is a person who is truly altruistic. There are strongly intrinsic people, but I believe, especially in a capitalistic society, that everyone realizes that there are benefits and costs to their actions and will usually do things that are more likely to benefit them, likely due to reinforcement. I think that the stance you took in this post is good. That being nice is not always because you are a nice person. There are so many things that influence your behaviour and thoughts. It’s crazy how easy your beliefs, actions and thought patterns can be manipulated. So yes, it is good to think critically about if someone is being nice, especially if it is someone you are unfamiliar with or its an ambiguous situation. I’m pursuing a Psych degree myself, so it’s cool to talk with someone who has knowledge on this subject! I agree that a blend of intrinsic and extrinsic motivation is necessary, though I’m not sure if I agree that there aren’t people who are truly altruistic. They would definitely be extremely rare, but I find myself apprehensive of applying extremes to people – though that argument could be used to say that “truly altruistic” is in itself an extreme. Still, I think that there are people who have conditioned themselves or people who possess some deep moral compass that do the things they do for the sake of benefiting others and their fellow human beings. Thank you for your thoughtful comment, I’m glad a psych honors student thinks what I’ve written is of some value. I agree, in fact. There are plenty of people who go through the motions without any actual consideration of others. I think it can help to break “nice” down: are you considerate? do you care about others? do you think about points of view different from your own? do you act to avoid causing suffering in others when possible? do you listen? But also, being “nice” isn’t just about nice actions. It’s also about refraining from nasty actions, and without that aspect of considering others, there’s no guarantee. I agree that there are several components that comprise niceness. People can be nice in various ways and not so nice in others. It is also important to refrain from rude or nasty actions, though I think in order to attain a genuine level of niceness – whatever that means – one does need to help other human beings or act in a way that will bring others benefits of some kind. Thank you for reading and for your comment! Pardon me for using a personal example (it’s just in my mind since I’m about to write a post about it), but take B’s parents. Kind Christian family. Church-goers. Extremely active charity wise. Active in their children’s lives as far as soccer-mom and bake-sale-leader goes. But on the flip side: homophobes. Verbally abused their gay son until he killed himself. This is why I love the quote “You will always be the villain in someone else’s story.” B’s parents thought they were doing the right thing, whereas I see them as the biggest assholes on the planet. Ugh, your personal example really does show what I’m trying to say here. The quote you raise also adds a layer of intrigue to this discussion – to what extent will we always be the villain in someone else’s story, even if we try our hardest to be kind and moral and compassionate? Thank you for reading and commenting Becky! To clarify, you were talking about not trusting everyone who does nice things? If that is so, then yes, I agree. hm.. I’m not very good at translating what I think.. I’m stupid. To me it will take time until I trust someone. I usually prefer if I’m trusted first before I trust them. Then you know it’s mutual. But then it’s hard to know.. :s I guess trust and niceness is, like you said, not black and white. You mentioned good too. Not all nice people are good. And all people can act ‘nice’. Nice sounds weird in my head now. You’re not stupid! I think that’s essentially the point of this post – some people perform kind actions due to their environment as opposed to an inner moral compass. Just like sometimes people do “bad” things based on those around them even if they are not intrinsically bad people. I’m glad that this post has made you think; this issue is definitely no black and white. It’s like… well, there are some people I detest. But I try not to show it, because that would be rude. So I’m polite, but it’s because I have to be. I feel like that sounded really bad. I think the reverse can also be true – people can have nice intentions that are hurtful. Don’t feel guilty, I know that feeling – I think it’s important and necessary to remain polite even around people you don’t consider friends. Just like how we should try to treat everyone with compassion even if we do not agree with their views or actions. You’re right, the reverse is definitely true. Thank you for reading and commenting! I tend to think people who naturally trust others to be naive. It’s always glorified, this kind of benevolent being character, but honestly, it’s not a practical way to live because everyone is a mixture of bad and good parts. Nice is overused anyway. I’d rather be good/fair/equitable than nice. I agree with the sentiment that no one is 100% good or bad, people are way more complex than that. It’s intriguing that you value tenants like being good, or fair, or equitable. Thank you for reading and commenting Michelle! Thomas, I think you are correct that niceness is not the most essential quality – the motivation is important too. I am in philosophy this semester, so I’ve been reading lots of Aristotle as well (although this reminds me more of my reading of Kant). Nice actions do not equal nice person. However, there is more to life than simply being “nice.” I personally believe that the right thing does not always appear “nice.” It should be done with love and with the best interests of everyone in mind, but it may not be perceived as “nice.” We should endeavor to treat others with love, the way we want to be treated – nice just does not encompass all of that. It’s great that you also took philosophy this past semester and that you delved into Aristotle and Kant! I agree that there is more to life and being a moral person than just being nice – it may be a part of it, but you’re right that the way we treat others should entail love and a true genuine compassion. I’ll come at this from my philosophy background. And you’re a little right and a little wrong. First, something that doesn’t matter: whether something nice in the past is nice now. You conflate niceness with morality here. That being nice has to be doing something morally good. More to the point, you ignore the possibility of moral relativism here. Things in the past might have been nice, but they are not nice now, doesn’t mean they weren’t “nice” back then. Think of it this way. It was nice for a slave owner to give his slaves the day off since they are his chattel and he doesn’t want them overworked. It was in fact nice for the slaves to have the day off, but morally repugnant for how the slave owner came to this realization. But that brings up the big question, does being nice have to line up with morality. In this way, your friend could very well be right. She’s coming at it from a utilitarian background where motivation doesn’t matter. Helping someone out is still helping them out even if you’re angling for a reward. For instance, isn’t it morally okay and nice for someone to return a lost dog even if it’s just for fifty bucks? And then you conflate goodness with intrinsic motivation. This is Kantian, not Aristotelian. Aristotle is nobility, someone who does things for their own sake. It is beside the question of whether he has intrinsic motivation or not, it is outside of that. He might not want to do them but he still does them, many noble people do not want to do the good that they are doing, but they are noble because they still do it. So what you really want is Kant. You want goodness and niceness be due to intrinsic motivation and probably something you really want: treats people with human dignity in doing so. They do it because of the inherent human dignity of the person. And it is with Kant that you have a moral backing to the Bob counterfactual. Kant explains why Bob is kinda scummy. If you’re interested in nobility ethics, check out Nietzsche (The Walter Kaufmann book and translations – not RJ Hollingdale) and Macintyre’s modern take on nobility ethics. I have to say this was very interesting. And even though i’m not the blogger, thank you for writing it ^.^ I enjoyed reading it. Being a nice person is complicated! I usually try doing it because I want to but there are times when I’m forced to. 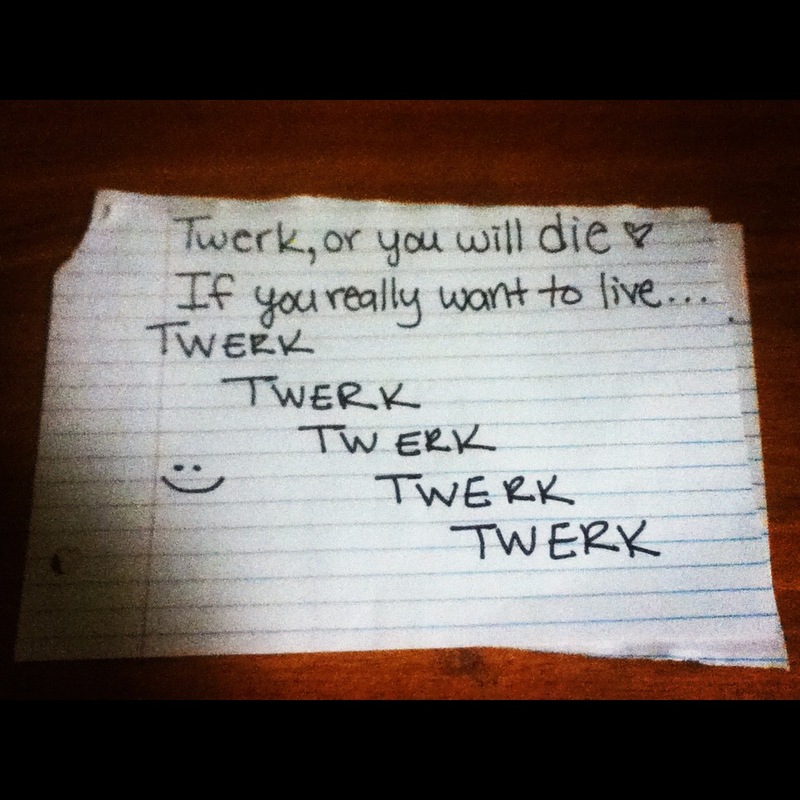 I think you summed it up nicely though with your examples and bro, you better be twerking eerrrrr day! P.s. I’m debating whether or not I should just somehow shove Aristotle and Dante Discover the Secrets of the Universe into my reading schedule because you keep liking reviews of it! And it sounds beautiful. I think you really hit on one of the reasons why Aristotelian ethics has always appealed to me moreso than Kantian or utilitarian–there’s something about his emphasis on virtuous intent that’s just made more sense to me than deontological or teleological conceptions of morality. Yes, out of three Aristotle appeals to me the most as well. Thank you for reading and commenting! Wow. I do not know what else to say. What nice is…. pleasant, agreeable, selflessness, generous, friendly You are really making me think. Also another good point touched on is why people are nice. Is this how it makes an individual feel, is It how they are perceived, or about how one wants to be perceived. I really need to think on this one. Ron, I’m glad that this post has motivated you to think more deeply about what being “nice” and what being a “good person” really mean! Happy holidays as well, and thank you for reading and commenting.